NOTE: All of the music on this program is from recent recordings of sacred music by Cipriano de Rore (c.1515/15-1565) featuring the Brabant Ensemble directed by Stephen Rice. The recording is on the Hyperion label and is CD CDA67913. The Brabant Ensemble continue their investigation into unknown jewels of the Low Countries Renaissance, researched by their director Stephen Rice and recorded with equal amounts of passion and erudition by the young singers of the group. 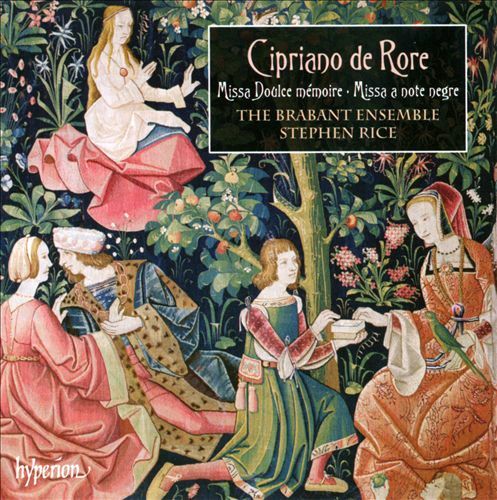 Cipriano de Rore was and is principally known as a madrigal composer, and, as Stephen Rice writes, ‘blended the contrapuntal complexity of Low Countries polyphonic style with Italian poetic texts to create a newly expressive vernacular genre’. This recording represents something of a new departure in presenting some of the least well-known aspects of the output of a composer who is justly famous in other fields. The album contains two Mass settings based on French chansons, Missa a note negre on a composition by Rore himself, and Missa Doulce mémoire, which takes one of the sixteenth century’s greatest hits, by Pierre Regnault dit Sandrin (c1490–after 1560) as its inspiration. Also included are three motets. Fratres: Scitote is apparently a unique instance of composition to its text: St Paul here tells the story of the Last Supper, in which Jesus takes bread, blesses and distributes it, and thereby institutes the ritual of Holy Communion. CIPRIANO DE RORE (1515/16–1565) is among the great names of the history of the madrigal, the secular genre that came to dominate Italian musical culture in the second half of the sixteenth century. Like other pioneers of the form, he was not Italian but from the Low Countries, being born in Ronse (French: Renaix), on the Flemish–French language border in hat is now Belgium. Alongside older Northerners such as Philippe Verdelot (c1480/85–?1530/32) and Adrian Willaert (c1490–1562), Rore blended the contrapuntal complexity of Low Countries polyphonic style with Italian poetic texts to create a newly expressive vernacular genre. As the century progressed, and substantially as a result of Rore’s own innovations, madrigals became increasingly expressive of the poetry they set, and eventually ceased to prioritize counterpoint, declaiming the text in clearer, more homophonic textures, and eventually monodically. A disquisition on the history of the madrigal may seeman odd way to begin a note accompanying a recording of sacred music: but in the case of Rore, it is unavoidable for two reasons. The ﬁrst is that his fame rests dis pro portionately on his achievements in the secular sphere, principally in madrigal composition, but also chansons and a sub stantial body of secular Latin-texted works, reﬂecting the increased interest in Classical antiquity and its lyric forms current in mid-sixteenth century Italy. This recording therefore represents something of a new departure in presenting some of the least well-known aspects of the output of a composer who is justly famous in other ﬁelds. The second reason for focusing on madrigalian composition is the extent to which its practices began to percolate into the sacred sphere during Rore’s lifetime, and in this regard also his impact on these developments was signiﬁcant. If one considers Rore’s style in juxtaposition with the music of his direct contemporary Jacobus Clemens non Papa (c1510/15–1555/6), the difference is immediately apparent, most obviously in terms of texture. Though both composers favoured writing for ﬁve voices, the overlapping and constantly shifting voice combinations of Clemens stand in sharp distinction to Rore’s clear, often quasi-homophonic declamation of the text. Rore’s entire musical career was made in Italy. It is possible that he was there very early in life, perhaps in the retinue of Margaret of Parma, the illegitimate daughter of the Emperor Charles V, but the ﬁrst documentary evidence is from Brescia in 1542. The extent and variety of dedications to Italian noblemen among his works of the 1540s suggest a concerted effort to ﬁnd gainful employment at a court; nearly half of his known compositions date from this early, freelance, stage. By 1546 Rore had found a position as maestro di cappellato Duke Ercole II d’Este of Ferrara (grandson of Ercole I, around whose name Josquin Des Prez’s famous Missa Hercules Dux Ferrariewas composed). He was to remain at Ferrara for twelve productive years, composing among many other works a Missa Hercules Dux Ferrarie of his own, based on a repeating ostinato motif. He left the service of the Este in 1558, at ﬁrst temporarily in order to travel to his native Flanders, but in the event permanently, since Ercole’s death the next year resulted in the hiring of Francesco dalla Viola in Rore’s stead. His next, and last, position was at the Farnese court in Parma, where he died in 1565.